As Americans ardently celebrated the bicentennial of the United States, Apple Computer went into business selling handmade computer kits and the NBA merged with the competing, but financially unstable ABA. Successful films from the year before, Jaws and Earthquake, were still playing in theaters along with new movies like Logan’s Run and Bad News Bears. Peter Frampton’s live album, Frampton Comes Alive, was the best-selling album with Dancing Queen and Bohemian Rhapsody topping the singles chart. Early in the year, Farmington’s City Council imposed a five percent amusement tax on Lagoon. Citing this and other problems with city officials, Lagoon attempted to de-annex itself from the city. The conflict continued for almost a year and a half when the district court declared the tax was unconstitutional while also rejecting Lagoon’s request for de-annexation. Meanwhile, work on relocating Pioneer Village from Salt Lake City was nearly complete and it was dedicated on Memorial Day. The new area added 15 acres and five new rides to the park (including the Log Flume which had already been open for one season). Another exciting new addition in 1976 was the Jet Star 2, a Schwarzkopf steel coaster brought in from Expo ’74 in Spokane, Washington. Weekend operation after Labor Day usually ended in September, but was extended two weekends into October. It was a big year that showed a family-owned amusement park could survive at a time when many of the country’s parks were either operated by large corporations or being demolished. May 31 – Pioneer Village Grand Opening, 11 a.m.
New Jet Ride set at Lagoon. Deseret News, 17 Mar 1976. Lagoon tax is unfair. Deseret News, 21 May 1976. Annexation valid? The Lagoon Issue. Deseret News, 21 May 1976. Pioneer Village events. Deseret News, 24 Jul 1976. Wade, Pam. Lagoon argues against city ties. Deseret News, 27 Jun 1977. Wade, Pam. Lagoon wins tax battle. Deseret News, 11 Jul 1977. Great Moments. 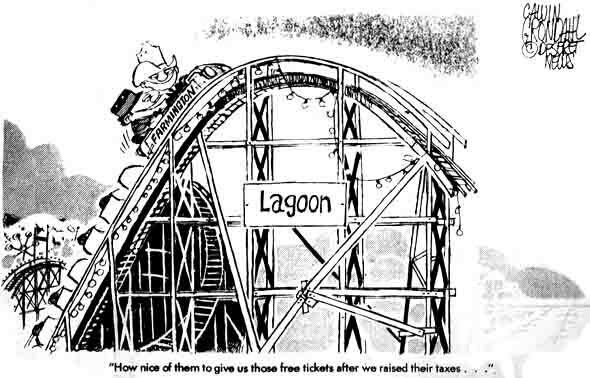 National Amusement Park Historical Association, accessed 13 Aug 2013.